A photographer and his group set out in the dead of winter for the Alaskan wilderness to take advantage of the limited, but beautiful daylight. 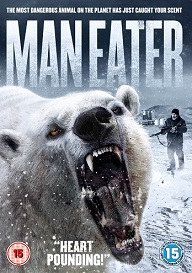 They are met by an experienced hunter and local lodge owner who instills fear within the group by telling them the legend of Maneater, a huge polar bear that has fangs and claws sharper than steel. This epic tall tale quickly becomes a real living nightmare, as the group is unaware that a bear experiment has gone wrong. The bioengineering company, Clobirch Industries, has genetically altered a polar bear so it can better survive climate change, but the end result is a relentless, deadly, man-eating, killing machine. It is up to our lodge owner and his native guide to protect the group from harm, but this bear proves to be more than he or anyone else ever expected.